As it has been on previous albums, the cover of David Ornette Cherry's most recent solo disc, Eternal Monologue, shows the keyboardist's last name in capital letters and colored red. It's a fitting tribute to his musical family, which includes fellow musicians Neneh, Eagle-Eye and Jan. But mostly it is there to emphasize the creative relationship between David and his famous father, the late jazz trumpeter Don Cherry. Jazz met the world of performance art with a fascinating performance (one of seven free shows offered Friday night) by David Ornette Cherry. Playing to about 300 people in the lobby of downtown's Paramount Hotel, his set with his group Organic Roots combined classical jazz sounds (a clear influence from his dad, Don Cherry) with African rhythms, spoken-word poetry and interpretive dance. The combination of wooden flutes, Malian drums and synthesized percussion and sound effects was startlingly unique, and you can't blame the spectators in the back for standing dangerously on top of chairs to get a better view. Like a lot of the jazz festival, this isn't something you can see everyday in Portland. Pianist Cherry (son of Don) presides over his father's landmark Blue Note sessions, Complete Communion and Symphony for Improvisors. That means plenty of room for free blowing and passages of collective improv, but also beautiful designs to hold it all. A rising Monkish interval and cheerful Ornette-type folk melody serve as the template for "Movement One - Instantaneous Text" - the rhythmic-melodic cells contained therein echo throughout the piece and serve as cues for changes in tempo and theme. Trumpeter Jon Williams (with mute) and multi-reedman Justo Almario (on alto) take ripping solos over Roberta Miranda's fast walking bass, and Cherry himself takes off on avibrant keyboard solothat splits the difference between Bud Powell bop and early Cecil Taylor broken runs. "Movement Two- We Remember When" features a Far Eastern scale (Almario on flute) in ballad tempo. A Latin rhythm kicks off "Movement Three-Start Off Fresh," breaking into uptempo excursions for Almario's clarinet and a wonderful passage where the collective improv subsides and Williams begins speaking with a slow, deliberate a cappella muted trumpet. The sound of that mute - high and bright - and Williams' conversational phrasing recall Don's pocket trumpet. It's a sweet elegy in the midst of this celebratory disc, recorded in 1999, andit's made even sweeter by the presence of Billy Higgins, driving the beat with his dancing, singing patterns. David Cherry's "Ensemble for Improvisors" kept our audience on the edge of their seats. Its thick sweet textures are tightly woven from culturally diverse phrases. The instrumentally distinct voices are in dynamic conversation -- sometimes explosively driven, sometimes quietly reflective. Its clarity and broad emotional range, from tough to tender, are reminiscent of Colemanesque free form but with greater melodic clarity and broader emotional range. This is an expansive and generous composition that encourages the individual artist/instrumentalists to share the space. Each flies and supports the flight of the others, a true "ensemble." The performance of David Ornette Cherry's beautiful work on our ALOUD at Central Library series stands as an all-time highlight in my fourteen years of programming the series. Cherry, the son of the late trumpeter Don Cherry, was born in 1958, the year his father and Ornette Coleman recorded their first album. And the title of the younger Cherry's first solo project (as well as its rap-jazz title piece) no doubt intentionally echo the intent of a somewhat later Coleman-Cherry recording, "Change of the Century." Although he has included two Coleman pieces ("The Memory of Things" and "From Top to Bottom"), the album is oriented much more strongly in the direction of the eclectic, world music combinations his father pursued in the years immediately before his death in 1995. "Multi-kulti" was the elder Cherry's description, and it applies here, as well. Working with an impressive array of Los Angeles talent--trombonist Phil Ranelin, saxophonist Ralph "Buzzy" Jones, bassist Roberto Miranda and cornetist Bobby Bradford, among others -- keyboardist Cherry produces music that alternates improvisational edginess and unusually textured ensemble sounds with attractive melodies and surging, world music-tinged rhythms. More than an extension of his father's (or Coleman's) goals, the album introduces an intriguing and imaginative new talent. David Ornette Cherry, son of avant-garde trumpet great Don Cherry (who also fathered, with another mother, Neneh Cherry and Eagle Eye Cherry), makes his bow as a soloist with a richly textured 10 - song debut, The End of a Century. Equally influenced by straight-ahead jazz, world music, the harmolodic inventions of his namesake, Ornette Coleman, and his father's "multi-kulti" -isms, David produces a dense mix of bristling invigorating grooves that swing, swoop and lope with inventiveness and purpose. He states, "The name of my group is Impressions of Energy. The musicians have contributed to the music trhough a back and forth rotation of energy - creativity which gives power to the music. Someone called (us) "a powerful presence conveyed in a non-verbal but musical way." Check "Sing To My Heart," "Rainy Heart," "Distant Glance" and the incredible "Escape to Jazziland." If the name David Ornette Cherry rings a bell somewhere in your psyche, perhaps its because he is son of Don Cherry, as the music-making children of the late, great musical griot continue to produce. While sibs Neneh and Eagle Eye have chosen a more pop-oriented path, David walks a deeper, more edgy path with his new The End Of A Century on the Tonga label. 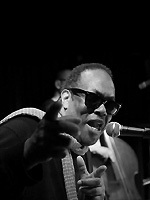 Keyboardist Cherry performs largely his own original material, often compete with verse, often engaging a variety of ethnic musical expressions, befitting his legacy. Guests include cornetist Bobby Bradford, trombonist Phil Ranelin, sister-violinist Jan Cherry, and numerous vocal shadings and verses. And you'll definitely feel Don's deep legacy and spirit here.